"Wii HD" Device: Saviour, Or Snake Oil? Some of these devices are pretty good. Others, not so good. And most completely irrelevant, since many TV sets and console already do the upscaling for you. How then does the VD-W3 fare? Easy To Install - The VD-W3 simply replaces the Wii's standard AV plug. 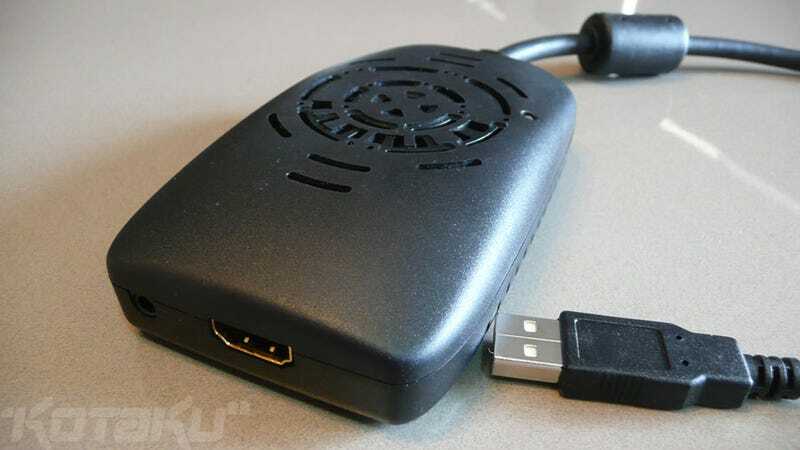 So slot it into the back of the Wii, plug it into your HDTV, and you're good to go. It's also powered through one of the Wii's USB slots, saving you precious space on your powerboard. It...Sort Of Works - In some areas, you'll definitely notice a difference. Perhaps because the VD-W3 works via HDMI (or, if you're using a monitor, DVI), colours were richer and better defined, as you can see in the comparison shots below. In-game menu shots were also cleaner, with pop-outs and text much improved over their usual appearance. It...Doesn't Work Too Well - The colours and menus are nice, but this is a $75 unit that's promising to display Wii graphics in HD resolution. And at this, it fails. As you can see below (I chose the SMG save screen because it had a great "jaggy" view around my noggin), jaggies are as pronounced as ever. Indeed, over the three games I extensively tested the device on, I only noticed a few areas where the actual in-game textures were improved. Too Fiddly - The VD-W3 had a little trouble with GameCube games, with some menu screens, intros and even the odd in-game load troubling its upscaling processor, resulting in lock-ups and distorted images. You can fix this by fiddling with the unit's settings, but these settings are tiny, tiny switches on the underside of the unit, which are difficult to even get to, let alone move into the correct position. Were this a universal upscaler (ie something that worked for your DVD player) that also worked on the Wii, I might recommend the VD-W3, seeing as it does a good job with colours and menus. But it's not. The unit only works on the Wii, and since it, well, doesn't really work that well on the Wii, it's tough justifying spending $75 on it. For the record, I reviewed the unit on my Pioneer PDP-LX509A. No allowances were made on the TV's settings for the "regular" comparison shots. Shots were taken on the same camera on the same settings under the same conditions. "HD" shots were taken using the VD-W3 connected via HDMI, while "regular" shots were taken using the Wii's standard component connection. The pictures are at an angle because from front-on the glare from my lights makes pictures useless. The VD-W3 also works on monitors via a DVI connection, but I was unable to test this, as I'm actually "between" displays right now. The VD-W3 Wii upscaler is produced and distributed by VDIGI. Retails for USD$75 UPDATE: VDIGI has contacted us to let us know that the price has been dropped to USD$59 following "user feedback". A unit was sent to us by the manufacturer for review purposes. Reviewed testing Zack & Wiki, Super Mario Galaxy & Wind Waker (GC), while Twilight Princess, Ikaruga (GC) and Super Paper Mario were also tested briefly. Note: these below are the comparison shots. The ones marked "HD" are using the VD-W3, the ones marked "regular" are through my regular component connection.